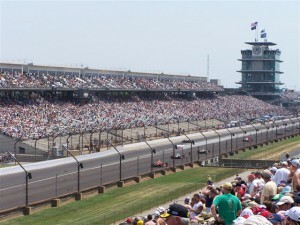 Home » General » Indianapolis 500 May 24th! 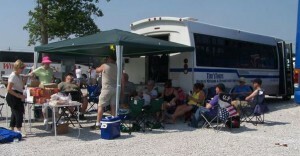 $115 includes transportation, H Stand tickets and even a tailgate party! Enjoy the comforts of the Tim’s Tours bus, special parking just outside the Northwest Vista of the track to minimize walking distances and fantastic seats in the H Stand in between the 4th turn and the famous homestretch and yard of bricks. No hassles, just FUN! Once again I’m looking forward to this event myself as I haven’t missed an Indy 500 in over 30 years! I have sat all around the speedway over the years and have concluded the H Stand is just about as good as it gets for the money. That’s where my personal permanent seats are at and where I’ve arranged for the group to be as well. And best of all, you get to witness The Greatest Spectacle in Racing! This is a great father-son event, client/customer, best buddies, hub/wife getaway, etc. I remember doing this with my dad when I was a kid and it was a magnificent experience! Push the CONTACT button for more details and reserve your seat!